Dust off your silly-bone and bring your funny friends and family out to join us for a day of laughter and levity! 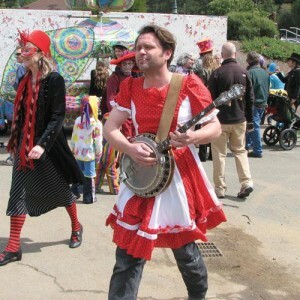 Come prepared to smile ’til your cheeks hurt at the Occidental Fool’s Day Parade! The Hubbub Club, stilt-walkers, and all sorts of silly costumed people and animals will wind through downtown Occidental ending at OCA for Lunapillar rides, refreshments, and spontaneous entertainment. This FREE community, family friendly event is for fools of all ages so make your self look as silly as you can and join in, or just come to laugh at the rest of us!